I suggested to Matthew Dahlitz, our Editor-in-Chief, that we could, now and again, devote an entire issue to an organisation, professional group, research group, or university lab. He enthusiastically agreed. This is the first of those editions. 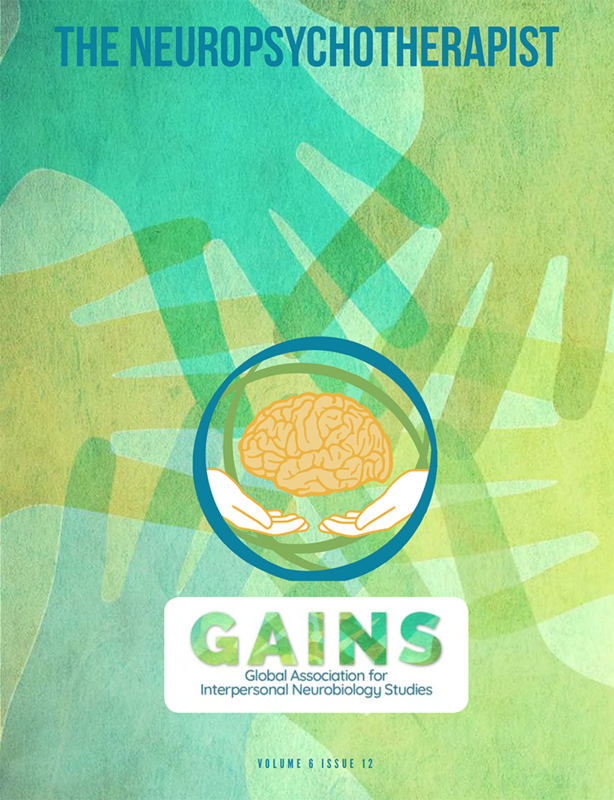 This issue is solely focused on interpersonal neurobiology (IPNB) with valued contributions from the hard-working members of the working board of the international practitioner organisation known as GAINS or the Global Association for Interpersonal Neurobiology Studies. IPNB emerged from a number of great minds and has been developing for more than two decades. The history embraces people who are now well-recognised names in their fields—Allan Schore, Daniel Siegel, Lou Cozolino, Stephen Porges and Bonnie Badenoch, to name just a few. Daniel Siegel is probably the person most associated with IPNB, but there are many others who have contributed to the development of IPNB, both as a set of ideas and as a framework of practice. The Norton Series on Interpersonal Neurobiology is one of the largest libraries on a single topic, with more than 50 books from a host of authors as diverse as Terry Marks-Tarlow, Marion Solomon, Pat Ogden, Alexandra Katehakis, Noah Hass-Cohen, Russel Meares and more. GAINS grew out of a series of conversations between a group who regularly met with Daniel Siegel, including Bonnie Badenoch, Carol Landsberg, Debra Pearce-McCall, Kirke Olson and Lauren Culp. In this issue, we will explore the neuroscience of IPNB and its application with Dr. Mary Meador, and discover how IPNB is applied variously to leadership with Lynn Redenbach and Debra Pearce-McCall, to relationships with Mandy Shewfelt, and to schools with Kirke Olson and Greg Czyszczon. As a special treat, we include a chapter excerpt from Kirke Olson’s book, The Invisible Classroom (W. W. Norton, 2014), which describes IPNB practices for children with learning difficulties, and a reprint of an article from the GAINS Quarterly archive—a 2013 interview with Iain McGilchrist, author of The Master and His Emissary (Yale University Press, 2009), in conversation with Bonnie Badenoch about “what matters”. To round off, we bring you a special look at the work of an important member of the GAINS advisory board—the poet and philosopher, John O’Donohue. In her insightful review of his book, Eternal Echoes: Exploring Our Yearning to Belong (HarperCollins, 1999), Lynda Klau reflects on the consilience between John’s philosophy, based on ancient wisdom, and the cross-disciplinary approach of IPNB. John O’Donohue is held so dear because, at the very heart of it, we are human beings seeking to find peace, compassion and kindness, which IPNB advocates as natural qualities that emerge when people engage their best selves in an interpersonal, integrating space. We hope this issue raises those possibilities in your mind.